Utility to include a codename for your application based on version (up-to v10.X.X-X). This works great alongside version bump utility: grunt-bumpx for keeping your version numbers and names up-to-date with each build. This was created by us in late 2013 and has had over 1,500 downloads to date, but as we've just released the Gulp.js version “gulp-codename”, it made sense to publish this as well. 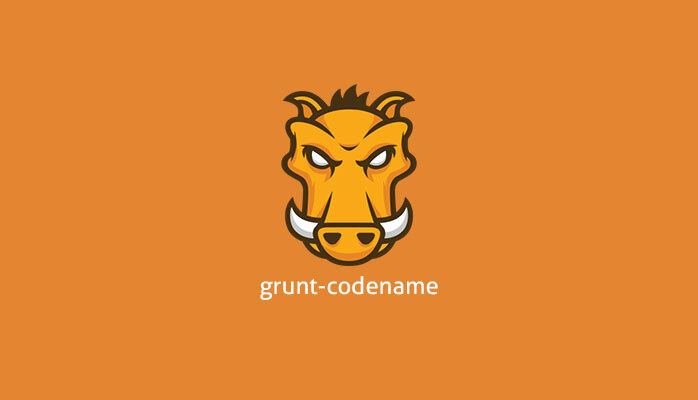 In your project's Gruntfile, add a section named ‘codename’ to the data object passed into ‘grunt.initConfig()’. // Task-specific options go here. // Target-specific files go here. codename allows to set the codename and patchName based on the version number of the configuration files (package.json, manifest.json, etc.) in your project. Only JSON files are supported, and each file must have a ‘version’ field compliant to SemVer guidelines; specifically following: ‘1.2.3-1’ being ‘MAJOR.MINOR.PATCH-BUILD’. patch: (Boolean) false - Generate a name for the patch version as well as the main codename. data: (File) undefined - Use custom JSON file for the codenames (and patchNames as required). codenames: (Object) undefined - Use a custom object for codenames. patchNames: (Object) undefined - Use a custom object for patchNames. Running the task in this way, the ‘codename’ field of each source file will be automatically changed to the correct codename for the build release. Running the task in this way, the ‘codename’ and ‘patchName’ fields of each source file will be changed to the correct codename and patch name for the next minor release based on the names contained within the user-supplied codenames.json file.